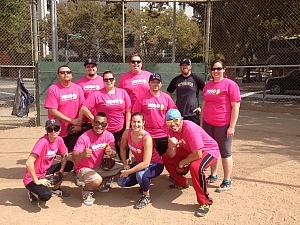 Congratulations to "Just the Tip" for winning the championship in our Sunday Funday softball league. They were dominant throughout the season and remained at or near the top of the standings the whole way. In the playoffs "Just the TIp" entered the night as the top seed. And, just like the regular season, they were dominant both on offense and defense as they defeated "Pluma" by a good margin. In the championship game they took on "The Strangers". Earlier in the season "The Strangers" took it to "Just the Tip" and picked up a 17-11 victory. No doubt they would be hoping for a similar scoreline one again. This time, however, "Just the Tip" would not be defeated and showed why they deserved the championship. Not only did they put up tons of runs, they also held their opponent to just 4 runs. That was a huge difference from the 17 runs they allowed in the first matchup and that defense proved to be the difference in this game. Again, congratulations to "Just the Tip" on a successful Sunday Funday League season! We look forward to seeing them defend their title!